I’ll probably get the pants sued off of me for using this picture, but I thought was a good picture. Anyway, I just read a little biography on the man named Steven Paul Jobs. His biological parents were Joanne Schieble and Abdulfattah Jandali. His dad was from Syria (now we know where he gets the cool nose!). They weren’t married, and they decided they weren’t ready for a baby. So they put Steve up for adoption. Paul Jobs was a repairman by trade, and he passed on his love for machines to his son. Steve loved watching his father, and he began helping him at a very young age. Steve met Steve Wozniak through a geek, excuse me, computer club. Woz, as he was called, had made a hobby of designing computers. They became good friends. Steve and Woz started their business on April Fool’s Day 1976. There business would sell circuit boards to people who wanted to build their own computers. They asked several of the local stores if they would like to stock their circuit boards. Everyone turned them down. One man was mildly interested though. He said he didn’t think the circuit boards weren’t marketable as there was a distinct rarity of computer building people. Thus, he asked Steve, and Woz, to make him fifty of the actual computers. He would pay them twenty-five thousand for all of them. The birth of the Apple. Why Apple? Because steve ate lots of fruit, and apples, he said, were the perfect fruit. Perfect, just like his computers would be. The Apple II was the next step. Woz wanted it to have color (What? Unheard of! ), sound (again, unheard of), and sharp crisp graphics. Steve wanted to have the computer be able to accept floppy disks. He wanted it to molded in plastic as well. At the time plastic was more expensive, but both Steves thought it looked cool, and that was important. Yes, Steve Jobs was the designer of the modern computer. That’s pretty cool. Trendsetting means that you’re successful. Soon after the Apple company grew (right around 1978) Woz was on a plane that crashed. Woz took months to recuperate, and he never returned to work full time at Apple. Steve had to work with other engineers now, and it wasn’t nearly as satisfying. The next Apple computer was a flop. No one wanted to pay $10,000 dollars for a computer. 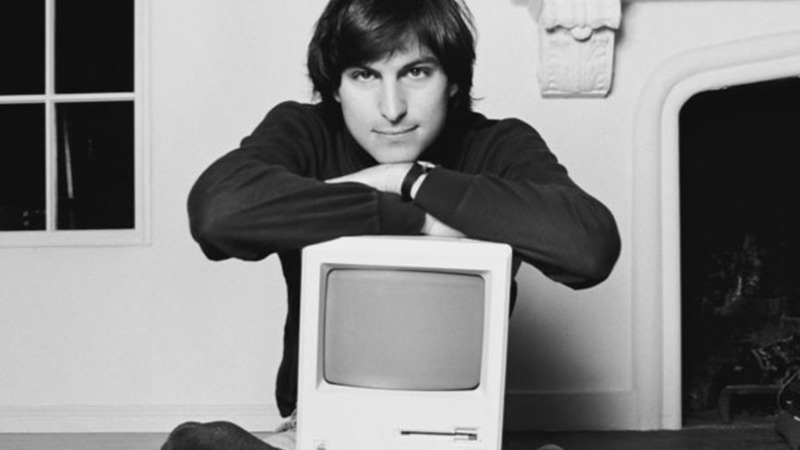 Steve then started working on the Macintosh, a computer that would change the world. Steve picked the engineers by hand, and he put them in a separate building. He flew a pirate flag over the building. “It’s a better to be a pirate than to join the navy,” Steve said. He meant it’s good to break rules, and think different. Steve was weird. He only ate fruit. He didn’t wear shoes. He thought that his diet made it so he wouldn’t have to take showers often. People didn’t enjoy working with him because he smelled awful. Despite all these things, Steve was somehow one of the most charming people anyone knew. Everyone called it the “Reality Distortion Field,” or RDF. When Steve said something, he always made it seem as though it would work, no matter what. In 1984 (real life) the Macintosh was released. The mac sold amazingly well–for a short time. Steve had misjudged people’s interest in home computers. 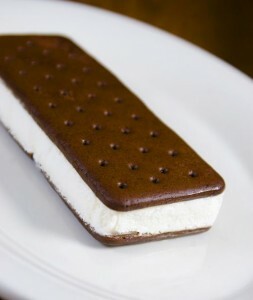 This caused some strife at Apple. John Sculley, the man who Steve had hired to run the business end of Apple, wanted to get Steve out of the company. The company board voted. Steve lost all of the power he had at Apple, in May, 1985. He was moved to another office which he called Siberia. Steve then went on to pour millions of dollars into the company he called NeXT. That was a failure as well. Steve spent a little time in limbo, during which he dated several women (including Bob Dylan’s former girlfriend), and located his sister Mona Simpson, a novelist. After a little while he got married. In 1986 Steve got to work with a man he admired very much. Steve became an owner of George Lucas’s computer graphics company. They called it Pixar. The problem was that many artists didn’t think they needed to spend the money on something they didn’t think was necessary. Steve put more than fifty million dollars into the company himself. He paid himself a salary of fifty dollars a year. In 1991, Steve had to lay off most of Pixar’s staff. One person he didn’t lay off was John Lasseter. Lasseter made short films for the company, and Steve thought that he was the best form of advertising the company had. His short film, Tin Toy, won an Oscar. Despite the Oscar, Pixar was a failure, and Steve was losing his reputation. People thought Steve was nothing but a slick salesman. Steve eventually RDFed Disney into giving him the money for three full length animated movies. The first one was Toy Story. After that, Pixar went on to make a dozen hit movies. After struggling for ten years, Steve became successful again. He wasn’t a millionaire anymore, but he was a billionaire now. In 1993 John Sculley had been forced out of Apple, and Steve was asked to come back. Steve gave himself a salary of a dollar a year, and only agreed to run Apple for a short time, until they found a replacement. Steve made some big changes, like agreeing to work with Bill Gates in 1997. Steve also cleared out the clutter that Apple had started to make. He removed products that weren’t selling, and he laid off so many workers that employees were afraid to ride on the elevator with him. They were scared they’d lose their jobs on their way to their floor. Steve created the Internet Macintosh. The iMac was the next biggest thing. Apple convinced Steve that he should stay with them. From there, the rest is history. The First Apple stores were created in May, 2001. Steve designed them himself. Then, in October, 2001, Steve pulled the cat out of the bag, actually the iPod out of his pocket. He created iTunes, and convinced the Beatles to sell their music on it. Steve then created the iPhone, in 2007, that was a huge success. On top of that, the rest of his products evolved into what they are today: the sleek, powerful super-models of the computer world. In 2010, Steve introduced another groundbreaking device, the iPad. Apple sold three-hundred-thousand in the first day. In 1997, Apple nearly went bankrupt. In August 2011, Apple was the most successful company in the world. Steve finally retired from his company, and spent lots of time with his friends, including Bill Gates. On his death bed, Steve looked at his sister Patti, then his children, and then his wife. A salute to the man who thought differently. Who asked “What if?”. A man who cut against the grain. A man who took chances. A man who changed the world. When writing about a bad guy, I’ve stated before, you must make him realistic. He must be lovable, as well as hatable. He must have qualities, or goals, that are noble, and worthy of praise. J. Edgar Hoover was exactly such a man. He was a fine, upstanding citizen, raised in the early twentieth century. His goal was to organize, and run, an exceptionally efficient organization, known as the FBI. Hoover was quite efficient in all of his ways. He discussed, with an advisor, that wanted criminals would have less of a chance of escape if he deputized more agents. Shortly thereafter Hoover developed the Ten Most Wanted list. Hoover’s desire to lower the odds for criminals translates to one of the best law enforcement agencies in the world. The FBI is also one of the most feared among gangs, the Mob, and the Mafia. The start of Hoover’s problems (or the problems Hoover caused), was closely related to his beginning at the FBI. When he became the director, Hoover started throwing the bad guys in jail. To quickly summarize, Hoover was dealing with the most famous gangsters, killers, and kidnappers of his time. They were dealing with an organization that they thought was porous in its law keeping. Hoover surprised them, and they all went to jail. Hoover got his first taste of perfection, and victory. He locked up Ma Barker and her boys, Herman, Lloyd, “Dock”, and Fred. Alvin “old creepy” Karpis joined them sometime around the late 1920s, and the early 1930s. Technically the FBI never locked up all of them, as most of them committed suicide before they could be captured. 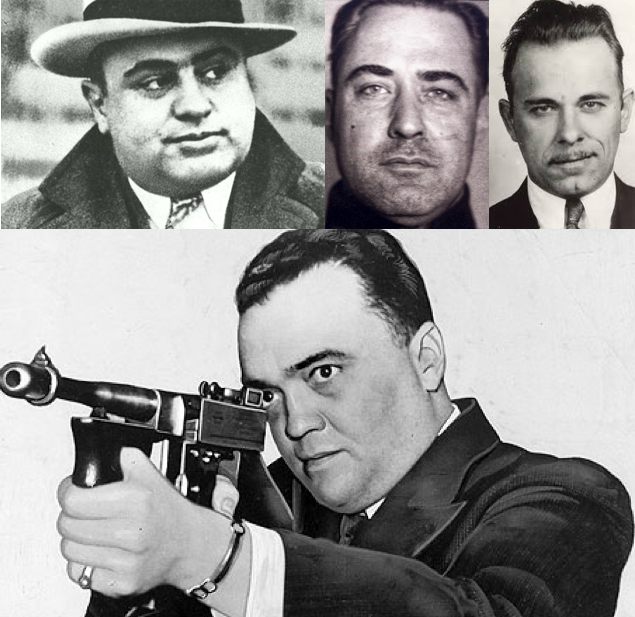 Hoover also killed, or put away, “Pretty Boy” Floyd, “Baby Face” Nelson, John Dillinger, and Bruno Richard Hauptmann (Charles A. Lindbergh Jr. kidnapper.) “Machine Gun” Kelly, Al Capone. All of the famous bad guys. During the Prohibition, Hoover and the FBI were quite active. Drinking is something that many people do, and the fact that it was illegal doubled if not tripled the number of drinkers. People like illegal things. (Not to mention, selling it to addicts would make any bootlegger a fortune.) Point is, there were a lot of shoot-outs, and since “the manufacture, sale, or transportation of intoxicating liquors within… the United States… is hereby prohibited,” the FBI had a certain amount of jurisdiction, as the law was passed over the entire country. Thus making it federal law. G-Men craze came in the form of children wearing G-Men pajamas, and playing with toy G-Men machine-guns. There was even a G-Men magazine, and subscribers of said magazine were taught how to get finger-prints using flour, and they were taught the G-Men secret whistle (two long, and one short). During all of this Hoover developed his micro-management skills. He made sure that the FBI had a perfect reputation, and, most importantly, he made sure that the FBI got all of the big publicity cases. If Hoover knew one thing, it was how to play the system. Big publicity, equals free advertising. Hoover got the FBI’s MO out through the newspapers, and he didn’t have to pay. The MO was “We’re large, and we’re in charge.” It struck fear in the hearts of small crime-fighting operations, and criminals alike. During the cold war, Hoover was definitely an anti-communism guy. Another one of the good/bad sides of him. He hated communism… so much that he was radically against it. When President Harry S. Truman signed the Executive Order 9835, in March, 1947, I can see Hoover dancing a jig with sheer glee. Keep in mind that during the cold war, the entire country was commie happy. Everyone was a communist if they did anything out of the ordinary. You were a commie if you sat at the same table every time at the local diner. You were a commie if you sat a different table every time. The FBI investigated 14,000 employees, on the aforementioned grounds, and J. Edgar Hoover still wasn’t happy. He described communism as a disease that the USA needed to constantly guard against. With Executive Order 9835’s wording leaving everything to interpretation, Hoover was able to place wiretaps in peoples phones and such, if there was even a bit of suspicion. Hoover’s critics would constantly cite the small number of communists in the USA. Hoover would always reply, “It took only twenty-three men to overthrow Russia.” He obviously believed it could happen here. Point being, Hoover, and McCarthy, were both insanely against communism. Problem was that they both used the issue to investigate or eradicate political enemies, or anyone they deemed pee-pee ants. Hoover was doing the wrong things, but for the right cause. It’s the ultimate bad/good, good/bad struggle that every author wants for his antagonists. Unfortunately for you, my tired reader, there’s more. Ian, the writer soon to be searching for a book, or several articles on concise writing. I have recently (within the last month) read two books on the man known as J. Edgar Hoover. As a writer, I strive to create really good bad guys. Antagonists must be authentic, not your everyday, I’m-gonna-take-over-the-world-for-no-reason-other-than-I’m-a-megalomaniacal-megalomaniac type bad guys. I strive to make them three-, four-, even five-dimensional. If they appear human, and are lovable, and hatable, I feel accomplished. Either way, J. Edgar Hoover would make the best bad guy ever! 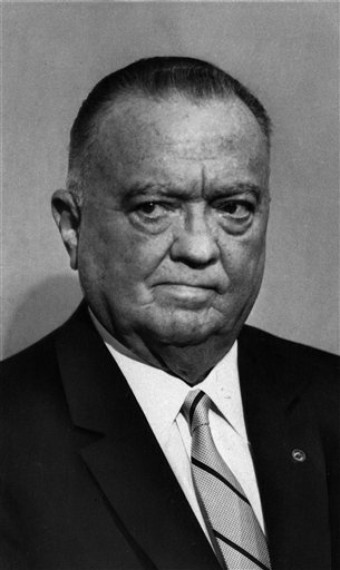 John Edgar Hoover was born in Washington D.C., January 1st, 1895. Quite punctual, as usual. Well, he hadn’t any “usual” yet, as he was just born, but… well, it set the standard I guess. He lived in the same house for the first 43 years of his life, a very Hoover-esque thing to do. He was a good kid, always kept his nose clean. “As a youth I was taught basic beliefs,” said Hoover. “For instance, I was taught never to put another book above the Bible.” Hoover never drank with any of the other high school students, instead he found companionship with his family. After graduating high school, Hoover took a job as a messenger and file clerk at the Library of Congress. He learned the incredibly complex card-index system, and learned it with a hunger. He worked at the Library for four years while earning a degree in law at George Washington University. Hoover was a man with a plan, and a man with a purpose. Many recall that he seemed more purposeful than most anyone else. His niece, and superiors were among the ones specifically quoted in the books. In July, 1917, he his law degree, and took as a clerk in the Justice Department (JD). Within three months, he had gotten a promotion. Over the next seven years of his career at the JD, Hoover would get promotion after promotion. After two years on the job, he was considered the JD’s expert on aliens. In August, 1919, Attorney General A. Mitchell Palmer appointed Hoover the head of a new division, the General Intelligence Division (GID). Its job was to “research” (spy on) political groups that the government deemed too radical, and thus dangerous. U.S. political groups! Using his index-card experience, Hoover created a filing system for the GID. The index contained information on 100,000 individuals who were considered political extremists. Within a few months this file had grown to 200,000 individuals. By the files third year of existence the number exceeded 450,000. Not content with this list, Hoover created a list of the 60,000 most dangerous. I’d like to point out that this man was already overreaching his bounds. The GID is a department of government that is highly unnecessary, and I believe is part of the reason Hoover was in on the Watergate Scandal. He felt that the government had power, and he was twisted by that power. Twisted so much, that he did things that he never should have done. Watergate was just one of those things. Hoover also hated communism. Another good point in this strange man. He wrote, “Communism is the most evil, monstrous conspiracy since time began.” He preformed a study on it, and quickly established himself as the nation’s number one authority on the subject. Look up the “Palmer Raids”, and you’ll see what kind of control freak Hoover was. Hoover was in charge of planning them, and the total control factor really shows up. He arrested many, many, many people on suspicion, and it was one of the most shameful times in America. America is a country that advertises freedom, but this was an act worthy of some Nazi, or Communist state. One year after the Palmer Raids, in August, 1921, Hoover, just 26 years old, was named the assistant director of the Bureau of Investigation (the FBI before the F, which is followed by “ederal”). The bureau was a place that was full of irregularities, such as a system used in one Field Office, but no system whatsoever in another Field Office. The Agents were awful, getting into trouble left and right. Drinking a lot, and even drinking while on the job. The FBI, I mean BI, was finding more criminals inside its walls than outside. Hoover was ticked. He set out from day one to fix the BI’s horrible system. He was taking over at a time when people where beginning to seriously question the bureau’s integrity. Image was everything to Hoover, and he was ready to get busy. Hoover noticed an extreme lack of focus in the personnel, and made them one of the top most priorities. Yes, plural, the Bureau wasn’t a very well run organization. In fact, it wasn’t a very organized organization. Hoover started by firing all agents who had a criminal past, or whose character was in question. Those who weren’t fired were retrained in “the way of the Hoover” as someone put it. Agents Hoover disliked, but he couldn’t fire without causing suspicion, where driven out by short-notice transferring. The agents reffered to it as being “on the bicycle.” Any agent on the short-notice list would be ordered to pack his bags and report immediately at his new post. It would go on and on until the agent resigned. Still others weren’t fired, but they quit because they didn’t want to work under the strict rules enforced by Hoover. Hoover also installed an entrance exam. Citizens of the U.S. who were white males, between the ages of twenty-five and forty, had 20/20 vision, good hearing, and good health were eligible to apply. Those who had law or accounting degrees were given preference, as Hoover thought they’d be more professional in their evidence collection. Hoover believed the un-professionalism of the Bureau was the leading cause of its failure to win any cases. Hoover was also the first directors to train the agents in the use of weapons. The agents were trained how to be an expert shot in revolvers, rifles, shotguns, and machine-guns. They were also taught how to launch tear-gas bombs accurately. When Hoover became the director of the FBI (it was the FBI then), he set the standards to include all of the Bureau’s employees, including typists, file clerks, and lab techs. No drinking on or off the job. Unseemly behavior wasn’t tolerated. No coffee breaks, and personal property at desks was completely prohibited. Hoover also installed a inspection system called the Internal Inspection Division. Agents from the IID would show up at Field Offices at least twice a year, and give out merits to FBI agents who preformed well, and give demerits to those who didn’t. Merits could result in a promotion or a raise, and demerits could result in a transfer to an unpopular location, and then finally to dismissal. Hoover said, “I want the public to look upon the Bureau as a a group of gentlemen. And if the men here engaged can’t conduct themselves in office as such, I will dismiss them.” Before long, the agents were considered men of goodwill, and great character. This was due to the strict rules, and Hoover’s ever-watchful eyes. He found that the TV show, the FBI, had a scene in which an FBI agent was alluded to driving a little above the speed limit, and he ordered the speed reduced. Each script for the show was reviewed by Hoover himself, and every detail during the filming process was watched by a hawk-eyed agent. If an actor held a weapon incorrectly the agent corrected him. If an actor had anything criminal in his past, he wasn’t allowed to act in the show. The actor that played Inspector Erksine was hand-picked by Hoover. Everyone that was on the set was background checked. Even the electricians, and the carpenters used to create sets, had to be cleared by Hoover. All so that the FBI’s reputation would be saved. Hoover was a man who knew how to work the political system. Don’t back down. Stand your ground, and make sure you hold all the cards. To close part one: Doesn’t Hoover sound so relatable. He works hard, he learns quickly, he’s simple, and he brilliant. He’s assertive, and meticulous. Maybe not your favorite boss, but he’d be a great son, right? Perfect, and self driven. This adds to my bad guy analogy. Hoover was a very well kept citizen, who grew up in Washington, D.C. He was raised so that he had strong morals, and was fine man. He loved his country, and hated communism. So far, so good. Hoover, as I have said, was a control freak when he took over the FBI, and that was something that would permeate the rest of his career. Overall, Hoover is likable, for the most part. He’s a good guy who fixed a corrupt FBI, right?